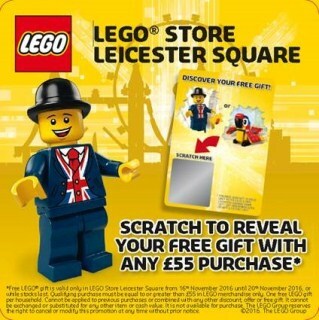 There has been speculation and chatter in our forum and elsewhere about how and when the exclusive Lester minifigure that is being produced to commemorate the opening of the new LEGO store in Leicester Square will be available. Here is how you will be in with a chance to get one: from the 16th to the 20th of November you will be given a scratch card with every purchase over £55 you make at the store. You will win either a Lester Minifigure or a Creator Parrot. Personally I am a little disappointed that it is not available with every purchase over £55. "Buy this much stuff for just a *chance* of getting a bonus!" - do you think this might be the start of a trend? Can I have a refund on this over £55 purchase please? Well that's just a dumb move of Lego. Well, that is a bit of a let down. With no idea of how many were produced, this could easily become one of the rarest minifigure produced. That is some serious BS right there! I have 2 parrots already, I would literally only be buying a set for the minifig. As suggested above, if I scratch another parrot it will be an immediate return/refund...seems a crazy strategy to me...although I guess most kids would be pleased with either so maybe this is an AFOL specific complaint. Are we in the UK Legos biggest customers? Maybe. And they can't even give everyone a poxy little minifigure when they've made the effort to go to the new store opening. I think they'll keep it as a flagship store exclusive with nice packaging and sell it for a fiver. Maybe that's wishful thinking! Who knows! just had to check my Lego calendar to make sure it wasn't April 1st today. This is a bit of a joke after spending 55 quid. Is that bowler hat available on any other minifig? I have no idea, but I'll be bribing my daughter to find out. No supper for her until she bags a Lester! What about the torso? I don't think that's available elsewhere except on custom / 3rd party prints. The lester availability is very poor, in my opinion. Disappointing indeed! That's just silly. Isn't the point of a Mascot to promote the store? Why not print produce a bit more and give more people a chance to own one? The parrot is quite a cool set, but that was the freebie months ago and they are not really local wildlife are they? Completely rubbish promotion that smells of money-grabbing / shifting a load of the left-over parrots that no one wanted. Very disappointing move from Lego. @iso3200, As you acknowledge, it's not necessarily a 50/50 chance. It could be 1/1000 for all we know. @Mattpj36, No, you wouldn't get any other promotional items. The promo material specifically says "Cannot be... combined with any other... offer or free gift". Of course, it also says that the store reserves the right to change its mind, so it could offer them after all. But as currently stated, it won't. @Lego Husky, Unless a full, unconditional return for refund is a condition of the sale (and I'd get that in writing if it is) or the goods aren't of "merchantable quality", a bricks and mortar store is not legally obliged to accept a return. I hope the Lego shop that is normally given away at store openings is going to be available too or this opening of the flagship store is going to be a big let down. Is it just me that feels Lego's marketing/PR department are not having a good year? So it's a choice between the Goodies and Monty Python is it? Union Jack Waistcoat vs a Dead Parrot...? What a disappointment. They must really have overproduced that parrot. I had two already, and with my latest purchase not only got the 24 to 1 gift but, hey, another parrot. Not that I mind getting another one, it's a freebie after all. But that Lester scratch card business seems really lame. Half the staff at Bluewater are strict and half are generous, never seems to be a in between! As for the scratchcard, surely all of them will have Lester and it is just a way of making you feel like you have won? @LEGO Huskey - Luckily I am in London with family and also work very close ;-) so I might have to try this tactic if things get desperate. It's going to be Mr Gold all over again. Have the Lego store sets always been given away on opening a new store? There's an invite only opening on 16th. Is that when they are likely to be handed out, maybe?? I have 7 ofor those parrots so I'm not super desperate for an 8th. I had been planning a 300 mile trip down to London and visiting the new store would have been 80% of the reason for the trip. Now I'm thinking spending a fortune on train fair to be in with a chance of winning a minifigure may not be the best use of my money. I believe the London Bus might be there too. My local store in MK said that they had their shipment of buses recalled to send off to the Leicester Square store for opening. Have Lego blown their budget paying rent in Leicester Square? How much does a Lego minifigure cost to produce? A few pence I suspect. They have so many great free set offers on at the moment, why make the Lester minifigure so complicated. In fact, why not post a Lester figure out to all VIP card holders and really surprise some of the Lego fans who live too far away from a Lego store. Was planning on going early on the 17th, any point if there is an invite only on the 16th? Going on the 17th, but there's nothing that I haven't already got that I want to spend £55 or more for the scratchcard. What I might end up doing, is getting that Spiderman Bridge set (£90) for the card, see what I win, and then going to Westfield London to get my refund. See you on the 17th. Adam K.
If I saved the £55.00 and bus fare to London, would I be able to buy one at Bricklink? There is no way whatsoever that I am gonna spend that much on a mini fig!! All this aside, do AFOLS still visit actual Lego Stores? Surely the best value is on Amazon, and Argos & Tesco on 3 for 2 offers. Other than paying full price for a set with Lego and getting a freebie I rarely visit my local store. I'd say the stores are for families with children who go into a store for the whole 'purchase experience'. I always find that the Lego store staff are very secretive about new releases and upcoming freebies. I don't get it at all. It's plastic not gold. Saying that though, some retired sets are worth more than gold 'pound for pound'! I agree the Lego stores arnt good on price for the general release products that they do, however the pick a brick wall appeals to me as I can get some of the bits I want for certain builds, you have all the exclusives such as the Modulars etc... Freebies that you cant get elsewhere, VIP points worth £5 for every £100 which at certain times can be double or triple, sales twice a year I think it is, other bits and pieces like power function add on's and the availability of everything in general as many places have offers but quite often don't have the stock. Thought I might pop in, but they can stuff that. And the poor staff getting abuse too! What a terrible decision, really poor from LEGO. @ meesajarjar72 "Are we in the UK Legos biggest customers? Maybe."............... Maybe not! Lego offers annual reports and as per the most recent (2015) "LEGO® sales Most major LEGO markets experienced growth in 2015. The Group’s largest market, the US, grew double digit, as did the UK, France, Italy and China, while Central and Northern European markets achieved healthy single digit growth rate"